Philosophy has launched Peaceful Harmony, a new fragrance for women. peaceful harmony is philosophy's new fragrance that is an extension of you at your best, with your head and heart coming together in harmony. Balance is beautiful. [...] Neroli and citrus invite your spirit to soar. Iris, lily of the valley, and lotus flower joyfully mingle. Warm musk, moss, and light cedar radiate. 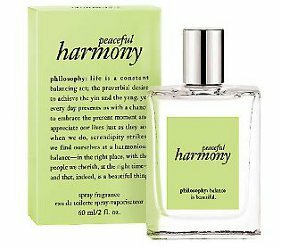 Philosophy Peaceful Harmony is available now at QVC, in 60 ml "Spray Fragrance", $46. Ha! I love Amazing Grace, but it lasts about 20 minutes on me and then is gone. The other ones of this line that I have sniffed have left me uninterested. This one sounds nice though, several of my favorite odors. Our local Ulta carries some Philosophy. Hopefully they will get this one in so I can smell it. They don’t do powerhouse fragrances, it’s true. Would guess this will be at Ulta eventually.